You'll "see" your property on paper and be able to envision your plans more clearly. You'll create an inventory of what you already have in your backyard. This inventory will be a definitive starting point for your project. Once you know exactly what you have, you'll be ready to plan what you want to do. Measure the four sides of your property. To see where shadows will lie in your yard, determine which way is north. Work out a scale for your map using graph paper. One square centimetre of graph paper might equal one square metre of your yard. The scale you choose will depend on the size of your property. On the map, show the locations of existing shrubs, trees, water sources, sheds, septic systems, underground cables, travel lanes, patios, fences, and so on. Indicate sunny and shady areas. Look for buildings or trees outside your backyard that will affect the amount of light that falls on your property. This information will be useful when the time comes to plan your changes. Remember, a site that is shady in the morning may be sunny in the afternoon; check this more than once. Note the time of day when you check. Note the human traffic patterns in your backyard - for instance, a path you take to your composter, an outside tap, or a spot for a table and chairs. Show the way in which water drains off your property. Hills, mounds, and slopes will have an effect here. Make a note of the prevailing wind, or the direction from which the wind generally blows. This will vary from area to area. A local weather office can provide the information you need. Check to see if any of the recommended plant arrangements already exist on your property. Refer to "Choose the Perfect Planting Arrangement" for more information. Make a list of the wild animals that visit your yard and the plants that already grow there. Consult field guides for help with identifying species. You have set up a plan of action and created a map of your present backyard to create an inventory of what you have. 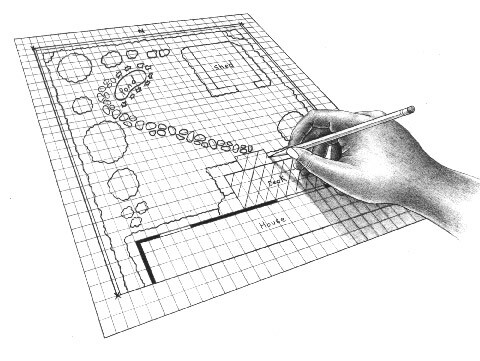 The next step is to draw up a rough site plan of what you want to add to - or eliminate from - your yard. Shift around cutouts of trees, bushes, bird houses, and so on until you're pleased with the arrangement. When your rough site plan has been worked out, you can draw up a final version.